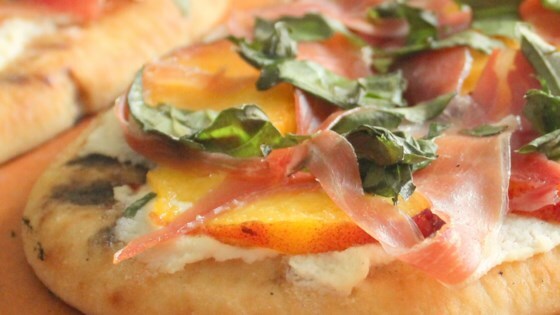 "Soft naan topped with a light spread of ricotta, topped with sweet peaches, salty prosciutto, a little basil, and a drizzle of honey balsamic reduction - all grilled to perfection!" Combine balsamic vinegar, honey, lemon juice, and pepper in a small saucepan. Bring to a boil over high heat; reduce to low. Simmer until mixture has reduced down to 1/3 cup, about 15 minutes. Grill naan until faint char marks appear, 2 to 3 minutes. Spread ricotta cheese over the charred side. Top with peaches and prosciutto. Sprinkle with basil. Drizzle with balsamic reduction. Return flatbreads to to the grill. Grill with the cover on, until the cheese is melted and the bottom of the flatbread begins to char, about 7 minutes. See how to make a quick-and-easy sausage pizza on the grill. Goat cheese may be substituted for the ricotta. This was great. I think the secret is the honey-balsamic sauce. I used regular pizza crusts and just baked them, and I also subbed bacon for prosciutto.